The best time to introduce your child to the love of riding is when they are young. If you own a horse and have children, you should purchase youth saddles for your children and introduce them to a love of riding as soon as possible. and large enough to fit around an adult horse. A kids saddle is not about the size of your horse, rather it is about the size of your child. Part of finding the right saddle for your child is about measurements and fit; the other part is about teaching your child how to take care of their saddle and how to have pride in what they are doing. The most important part about selecting a saddle for your child is to be sure that you include your child in the process. Yes, you want to find a saddle that fits them properly; however, you also want to buy a kids western saddle that your child likes and is proud of. If you shop for a saddle online, have your kid sit down with you and look at pictures together. Ask them which ones they like and why. Use this time to bond with your child while you help guide them towards a saddle that will work for them. If you have a local store where you can go and look at saddles in person, take your child with you and let them explore. Children learn a lot through visual and sensory experiences. Allow your child to touch the different saddles, and sit on them if the store allows this. Instead of just measuring your child, talk to your child about how the saddle feels and how the stirrups feel. If you want a saddle that is comfortable for your child to sit in. In order to select the correct saddle size, you need to have your child sit down. Then you need to take a measuring tape and measure the length of their upper leg. In order to measure the length of their upper leg, you need to measure from their knee to their backside. The length of the upper leg is one of the main factors in determining what size saddle your child needs. You want to choose a saddle size that is about 10% longer than your child’s upper leg. For example, if your child’s upper leg is 9 inches long, you should get them a 10 inch youth saddle. If your child’s upper leg is 11 inches long, you will want to get them a 12 inch saddle. Even though you should base the size of your child’s saddle on their measurements, it is good to have an idea of average saddle sizes based on your child’s age. That way you can judge how long the saddle you purchase may last your child and how much you should invest in it. This is just a general sizing guidelines. Everyone grows at different rates, and the age range listed above may not be accurate for your child. That is why it is important to measure your child’s upper leg. If they are just on the cusp of a large saddle, you may want to purchase the next size up for your child. make sure you also check out the stirrups. Make sure that they can be made short enough to fit your child comfortably. If your child’s legs are really short, you can purchase a stirrup helper. 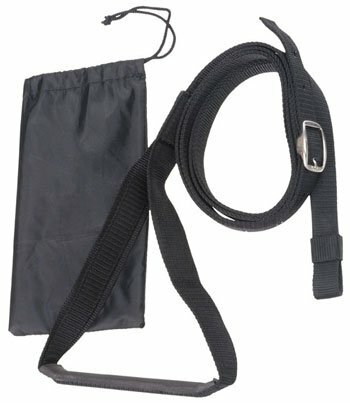 A stirrup helper generally consists of nylon webbing that you can wrap around the saddle horn in order to adjust the stirrups to fit your child’s legs. Once you find the right saddle, make sure you teach your child how to take care of their saddle. If your child is really young, start with teaching them to wipe down their saddle after they ride and how to hang it up correctly. If your child is old enough, teach them how to wash the saddle down and how to clean the saddle with leather oil and conditioner. If your child loves horses, be sure to involve them in the process of choosing their first youth western saddle. Teach them to appreciate and take care of their saddle and their horse at a young age. We hope this article has helped you with top information about buying children youth saddles. You know your child and now you have the ammunition to make a great choice with your child’s own youth saddle. Great riding enjoyment to you! A great discussion on how to best chose youth saddles. What is best is to involve your child in the process. This will Instill a passion for horse riding.